LOS ANGELES, Aug. 24, 2012 -- "Agent 88" (http://www.Agent88Films.com), a dark action comedy that tells the story of the world's deadliest assassin - an 88 year old British woman with Alzheimer's - has accomplished an unprecedented achievement via Kickstarter raising the most funds ever for a live-action web series pilot further pushing the "Agent 88" brand initiative. "Agent 88" is a comic book-style cinematic romp full of martial arts action, amazing special effects and unforgettable characters. 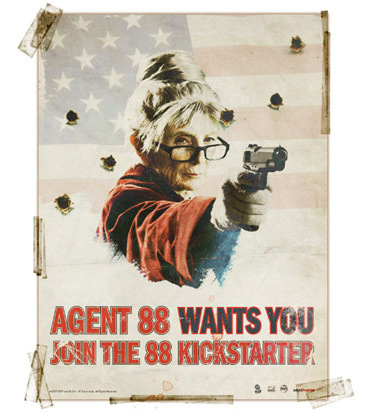 Under the guidance of Creator and Director Digger T. Mesch and Producer Jan Utstein-O'Neill, Agent 88 gathered support from some unlikely avenues. Tapping into gritty genre fans and rabid collectors sparked an enormous interest in not just the concept but the many donation incentives, eventually leading to its historic Kickstarter run. (Hollywood, CA July 23, 2012) An aggressive 30 day Kickstarter campaign has been launched by Director/Artist Digger T Mesch of Dig Deep Entertainment and Producer Jan Utstein-O'Neill of Hurricane Entertainment in support of a web series that introduces the world's most deadly assassin. 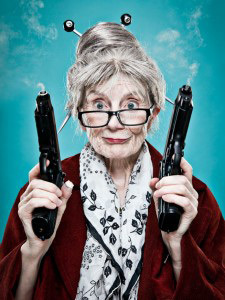 The surprising spin on this seemingly atypical Kung Fu Shoot Em' Up series is that our hero is an 88-year-old British woman with Alzheimer's disease.